I love making childhood memorable for my kids (and for me). Some moments they won't remember, but we'll have photos to look back on them forever and I like to make as many of them special as possible. Growing up birthdays were a BIG thing at my house. I loved it! I make birthdays a big thing for my kids too. It is their one day all year that is all about them and I have no problem with spoiling them a bit on that day. We celebrate how happy I am that they joined our family and we have a lot of fun! 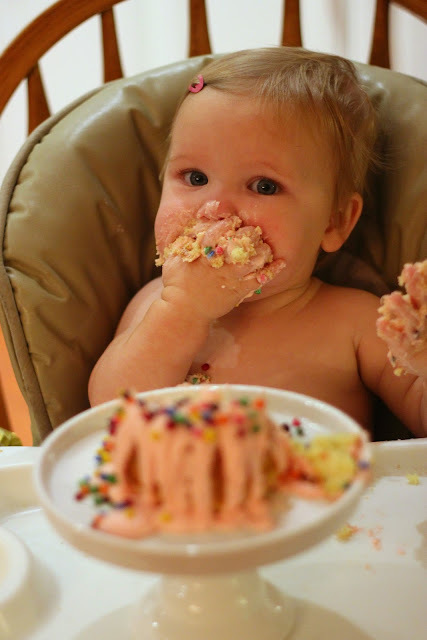 First birthdays are always the most low key in our family, since one-year-olds aren't too demanding and really just want boxes to play in and paper to rip. I like to think of first birthdays as being more for the parents, than for the kids, since they don't really care. If you are a big partier, then you might want to celebrate with a huge party and if you like a smaller shindig, then small is the way to go. Your one-year-old's personality can also determine if you do a big or little party as well. Some of my kids haven't been phased by large groups and some are absolute terrors if there are a lot of people around. These are things to take into consideration as you are planning a party. This year we had a super sweet celebration for my one-year-old's birthday and so I thought I'd share how we made it the "perfect" birthday for our family. It was simple, easy, and fabulous. We kept the guest list small (7 kids, 4 adults) to keep the anxiety and clean up level low and we really only needed four things! I pulled the party together the night before and it was fabulous! Birthday balloons are always a hit. I love the giant birthday balloons that spell out the child's name or show how old they are. I hit up Party City the night before my daughter's birthday and they were out of every color #1 except for pink and red, so fortunately pink went with my birthday decor and we grabbed it! She wouldn't have cared what color it was and she spent all afternoon dragging it around and it hitting it. I think the balloon was her favorite gift! I also loved having the balloon since it served as the perfect photo prop for cute pictures! We also blew up some smaller balloons for the kids to hit and kick and play with when they arrived. Our one-year-old thinks it is hysterical to kick balloons like she is playing soccer! This year I made a cake for our guests (just my brother and his wife and kids) and then I made a smash cake for the baby. I haven't done a separate smaller cake for a 1st birthday before but it was fun to use for picture taking without having the baby attack the whole big cake that then everyone had to eat from. At breakfast time we made a donut hole cake and let her play with it smash it around for a few minutes (mostly she just stuffed donut holes into her mouth as fast as she could)... but then we took it away from her and shared the untouched donuts with everyone else. At her birthday party, she got her own cake to dive into! She loved it! She actually stayed quite tidy too which was surprising. My oldest got cake all in his hair and everywhere. We got her a few presents (that I'll link below), but honestly she only cared about the tissue paper, boxes, and wrapping paper. The presents actually ended up being a way to help distract my four year old from being sad that it wasn't his birthday too. Ha! He "helped' open all of the baby's presents and tried them out for her as well. Such a sweet brother! With several of my kids I have gotten them a little ball pit for their first birthday. It is a hoot to see how excited they are about it. My daughter just went in and out and in and out all day. She threw the balls everywhere and was in heaven! Her big siblings had fun joining in and playing with her too. I made sure to put the ball pit on carpet this time (last time I didn't) so then the balls didn't roll nearly as far when they threw them! After we ate cake and ice cream, our little guests just played with our toys while the grown-ups chatted and my husband gave the birthday girl a bath. It was a low-key and short party (about an hour and a half max) and then we said good-bye to guests and got the baby off to bed. 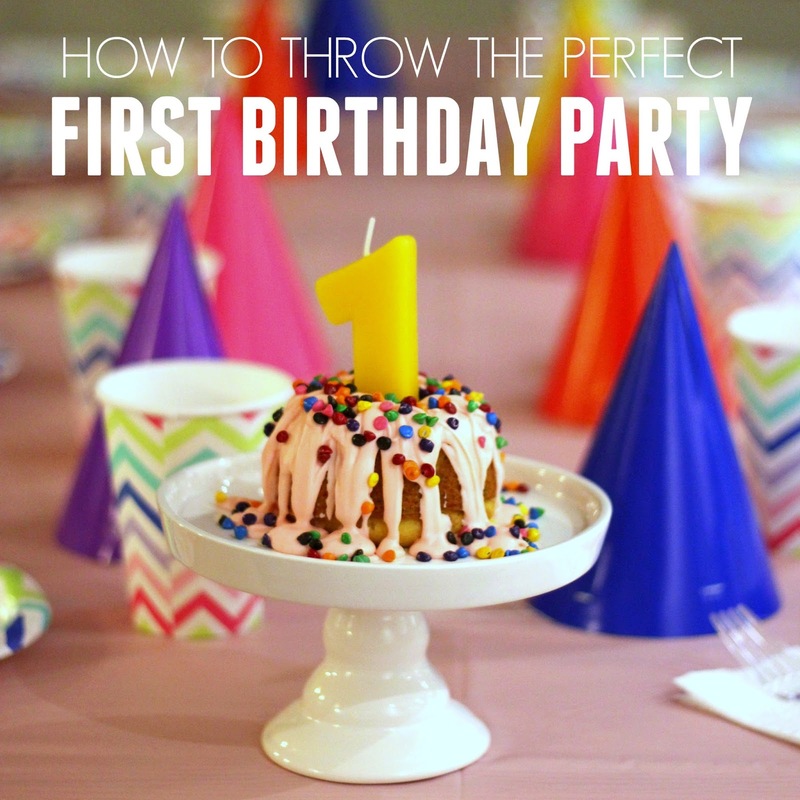 I love parties that are simple, easy, and low-stress! If you've thrown a birthday for your 1-year-old, what made it perfect for your family? What would you do differently if you were to do another one? 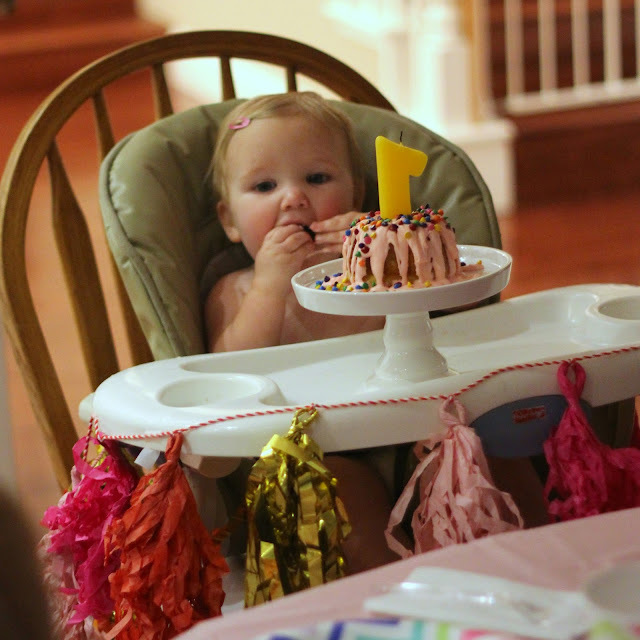 Any favorite tips you have for other parents throwing their first birthday party? 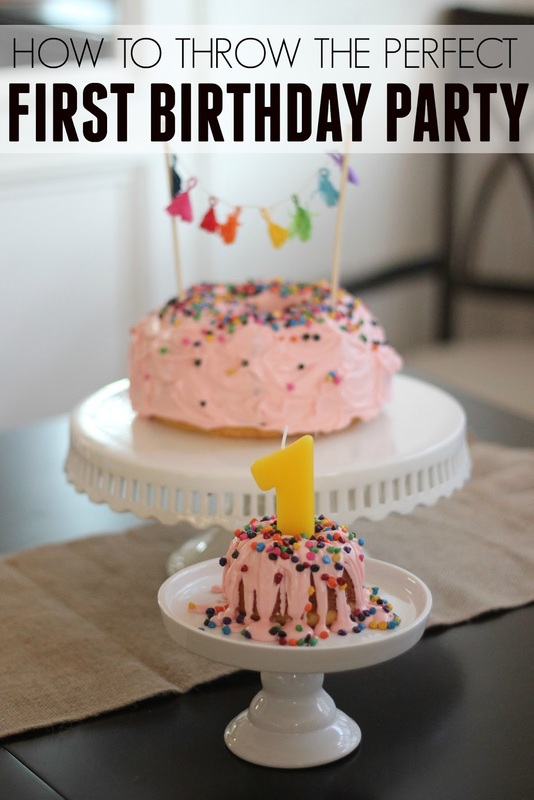 Have a child turning ONE soon? Check out all of our favorite gifts for one year olds HERE.